In this application note we measure the impedance of power factor correction (PFC) or DC Link capacitors using the Bode 100 vector network analyzer in conjunction with the B-AMP 12 amplifier. 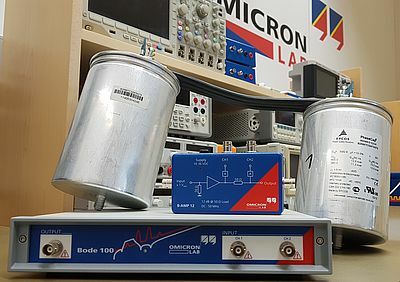 Two parallel metallized thin film PFC capacitor are used as the device under test. Since the ESR is expected to be very low, the Shunt-Thru measurement method is chosen and the impedance magnitude and phase as well as the series resistance are displayed to see the capacitors behavior. This application note was kindly supported by Malte Keil from the Fraunhofer IVI.